It would be putting things very mildly to say that recent Hindi movies haven’t made journalists – TV journalists in particular – look good. The typical representation is that of shrill, parasitic creatures tripping over each other in a mad frenzy, exhibiting buffoonery and insensitivity in equal measure as they thrust microphones into the faces of the unwilling. The classic example of this theme was, of course, Peepli [Live], in which vanloads of predatory reporters arrive at a small village on the scent of the TRP-boosting “story” that a poor farmer has promised to kill himself. It was a portrayal of media both as an intrusive force in its own right and as a mirror in which a middle-class society built on “traditional values” could see its darker, more primal face. But the template for the “ugly media” movie is Billy Wilder’s 1951 classic Ace in the Hole. Watching it again recently, I found it hard to believe it was six decades old – the story, about a personal tragedy being turned into a media carnival, is so ahead of its time that the film looks fresher and more relevant with each passing year. To some extent, that’s true of most of Wilder’s work. His best movies are driven by acerbic screenplays that poke holes into just about any aspect of modern life – or social institution – you can think of. 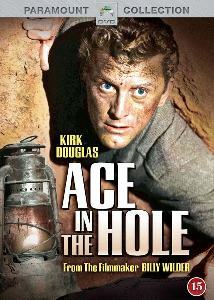 But even by his standards, Ace in the Hole is unusually savage and bleak. There is no light at the end of the tunnel, no happy ending, no bending to Hollywood norms about a lead character finding redemption. In a recent film, Michael Douglas reprised the role of Gordon Gekko, the cold-blooded Wall Street trader whom he first played in 1987. But few actors could portray single-minded, obsessive characters as well as Douglas’s father Kirk. 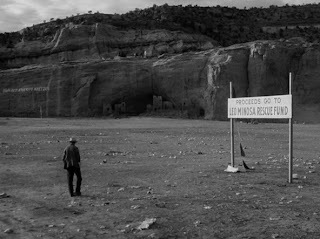 In Ace in the Hole, the senior Douglas is Chuck Tatum, a down-on-his-luck reporter stranded in a small town, working for an uninspiring local paper called the Albuquerque Sun-Bulletin (its high-mindedness as well as general lack of imagination summed up by the depressingly earnest motto “Tell The Truth”). 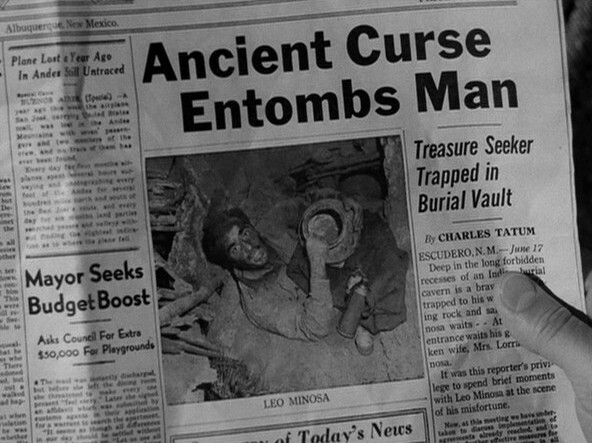 When a local tourist guide named Leo gets trapped inside an old mountain cave, Chuck realises he has a story that could help him get back to the top of his profession (read: back to the big newspapers in New York), and he milks it for all that it’s worth. “I don’t make the news, I only report it,” Chuck says defensively at one point, but we see him manipulating events for his own benefit – even to the extent of coercing the rescue-operation chief to use an unnecessarily time-consuming method to save Leo. 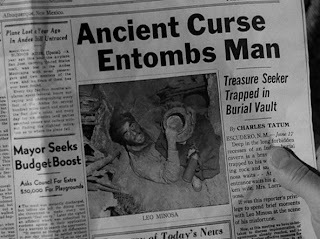 Some scenes are spine-chilling: during his first conversation with the trapped man, when Chuck discovers that the cave was an ancient Indian burial ground, his eyes gleam and become animated; you realise he’s less concerned with Leo’s plight than with the tantalizing headline of the next day’s paper. Typically, Wilder fills the screenplay not just with brilliant lines that draw attention to themselves but sly asides as well (“We’re the press, we never pay!” grumbles a young photographer when asked to shell out 50 cents for admission). 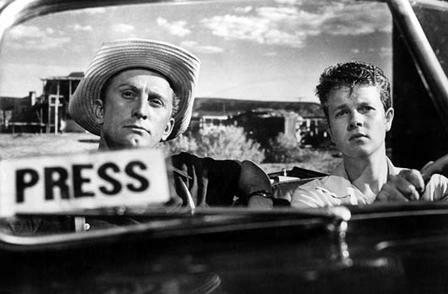 But watching Ace in the Hole, I was repeatedly reminded of Wilder’s great visual sense – something that is occasionally forgotten because he is seen primarily as a man of words. Consider the breathtaking overhead tracking shot that reveals dozens of cars and trailers recently arrived in what was once a deserted outpost. Or the scene where Chuck draws Leo’s manipulative wife towards him for a clinch by roughly grabbing her head (with the camera positioned behind her so that his giant fist nearly fills the screen) – it’s one of the most subversive variants I’ve seen on the classic Hollywood kiss. But the most most striking images – and perhaps the abiding one – is a long shot of carnival debris being swept along by the wind, as Leo’s father wanders desolately about; the shot is almost a symbol for the grime that accumulates over the course of the movie. At the end, there's no one left to clean it up. P.S. In a way, I think Ace in the Hole makes for an interesting companion piece to Sunset Boulevard, which Wilder made the year before – the visual and thematic similarities between the two movies should have any fan of the Auteur theory smacking his chops. For instance, both films begin with a man incapacitated by not having a working vehicle (or in danger of being deprived of his vehicle) – a situation that leads him to an isolated setting where he will feel trapped and creatively stymied. Without giving away specifics, both films, at key moments, have very artistically executed close-ups of a dead man seen from underneath, so that his face is almost looking down at the camera. And of course, both stories, in different ways, are about the creation of the celebrity cult. For me, one of the most disturbing moments in Sunset Boulevard is the brief shot of the gossip columnist Hedda Hopper (playing herself) in the final scene, where Norma Desmond (former silent-screen star, now a delusional old woman) descends the staircase, imagining she is about to make a grand comeback. Hopper is shown teary-eyed as she watches the faded star, but one can hardly forget the role that her own pen played in creating, sustaining and then destroying the image of Norma Desmond. What is the name of the movie? Ace in the Hole or The Big Carnival. "Even for Albequerque, this is pretty Alberquerque"
It says a lot about the condescending attitude of media towards "old-fashioned" reportage of facts. It is particularly true today when journos consider "creative" infotainment as a professional virtue and plain, albeit accurate reportage as a sign of mediocrity. It is a prescient film, though I've always found it a little turgid and humourless by Wilder's standards. Ofcourse, I'd anyday prefer it over Lumet's Network which is way too preachy and self-conscious. My favourite film concerning the fourth estate is Hawks' His Girl Friday. Now there's a film that keeps you on a high for its entire duration. Neel: Ace in the Hole was the original title, but it was later changed to The Big Carnival by the producers (probably to make it seem more mainstream - maybe even like a happy "circus" movie!). I think Kirk Douglas had the full story in his autobiography. 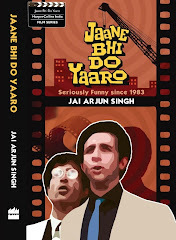 Now most DVD releases use the original title. I agree with you. The Apartment was also up there in bleakness (happy ending notwithstanding) but Ace in the Hole's savagery puts it in a very select class (Sweet Smell of Success might be a good companion film for this). Its worth noting that Wilder was one of the writers whose background wasn't in journalism, unlike Hecht and many others of the time. The comtempt dished out for the presss in this movie may be a by-product of that. Thank you for the review. Its very timely for me. I have recently watched 3 of his movies (Sunset Boulevard, The Apartment, Double indemnity) and I am hooked. They are masterpieces. So I planning to watch more of his movies. Will make Ace in the hole next on my list. Also read on the net that he is a big fan of Lubitsch. Sid: Wilder worked with Lubitsch in his early days in Hollywood - he cowrote films like Ninotchka and Bluebeard's Eighth Wife. Said Stanley Donen, "When you think about the breadth and scope of what Billy Wilder has written, produced, and directed, and then take into consideration that English is not even his first language, then you see that his entire output is staggering." Tatum says to Lorraine, "It's Sunday. Aren't you going to church?" She replies, "I don't go to church; kneeling bags my nylons." Wilder credited this gem of a line to his wife, Audrey-- "How would I know a thing like that? ", he said. Does it get any darker than this? A wonderful film. I saw on Alex Cox's lamemted Moviedrome series back in 1989 and it blew me away. 2006. It has still stood the test of time after 60 years. I doubt a film like this would get made by a major Hollywood director today. Does anyone know the name of the singer or band that performed "We're Coming, Leo"?